As we are just over four days away from Apple’s highly anticipated September 9 media event, the New York Times has chimed in with news of what their sources say we can expect. As for the so-called iWatch, it will come in two sizes, include health and fitness sensors, be able to display things such as maps, include NFC, while all housed in what sources say is a flexible screen covered by sapphire glass. It is expected to come in two sizes and combine functions like health and fitness monitoring with mobile computing tasks like displaying maps, said people knowledgeable about the product. It will have a unique, flexible screen and, like the new phones, will support technology that allows people to pay for things wirelessly. The NYT says the wearable device—which some people familiar said is one of the company’s most ambitious projects to date—will also debut in 2015, echoing similar reports from before, with no price mentioned. The ‘iWatch’ will be able to track vitals such as footsteps and heart rate, with more accuracy than similar fitness devices currently in the market, said two employees. The ‘iWatch’ will have a flexible display, said to be protected by a sapphire glass cover, with its internal circuit board coming in at the size of a postage stamp. 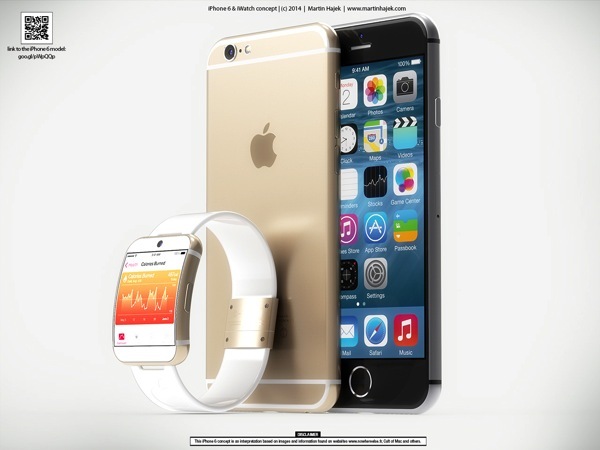 The smart watch will feature wireless charging, despite Apple’s previous experiments with solar charging. As for the larger iPhone 6 models coming, the larger 5.5-inch model will be more expensive than the 4.7-inch model, and will come with a design similar to the smooth edges of the current iPad line up. Now here’s the interesting nugget for the iPhone 6: it will supposedly come with a new one-handed mode to allow users to easily navigate the device with one hand, which users will be able to toggle on and off. Apple most likely has held back some of its new features in iOS 8, as usually when beta versions are released to developers, key features are publicly leaked. Earlier today the Wall Street Journal shared their own tidbits of what customers can expect from Apple next week, where it will live-stream its September 9 event at 10AM PDT/1PM EDT.